Over 20% of drones pose a risk to a manned aircraft – says new study done by Embry-Riddle Aeronautical University researches. 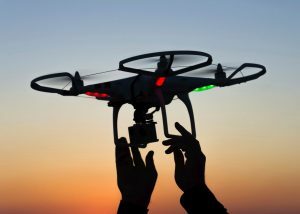 In the last four years there have been over 6,000 FAA recorded reports of near encounters between drones and manned aircraft. With high interest on the drone market, these encounters are very likely to increase in the next couple of years. The number of drones “in the air” will double from 1.1 million in 2017 to estimated 2.5 million by 2022. The number of pilots that control drones is about to increase from 73,000 in 2017 to estimated 300,000 in the next three to five years. The ERAU conducted their study near DAB airport in Florida. They have set up a UAS detection platform called DJI AeroScope. It’s a device that helps gather data and identify drone communication links, status and paths in real time. The whole project lasted for 13 days. The research team was able to collect the data of 73 DJI-manufactured unmanned aircraft. The drones have made 192 flights around the DAB airport. The thing is – this study only collected the data of one drone manufacturer, so there ware obviously more flights made by unmanned aircraft in the time of study. The research team compared the collected date to official FAA UAS Facility Maps. After the comparison the researchers were able to point out potential risk areas. The study showed that only 12% of drones they collected the data from were traveling near parks and unimproved land. Over 75% of the drones were flying near single family homes and residential neighborhoods. Over 20% of drones were flying above industrial and commercial properties. The researchers first thought that the majority of the drones would be flying in the open space, safe from hazards, buildings and airports, but it clearly wasn’t the case. There are maximum altitudes around airports authorized by FAA where unmanned aircraft can operate without any additional safety analysis. The study has found out that over 20% of the drones were not following the altitude maximum and were flying in the prohibited zones. The research team has compared the historical data from manned aircraft flights from the time range of the research. They discovered that more than one in five drone flights presented a risk to a nearby manned aircraft. One of the ideas that ERAU team has included in the study is for drone manufacturers investing more in a technology called “Geofencing”. It restricts drones from entering certain areas on the manufacturing level. This technology uses GPS and LRFID connections to set the boundaries. As far as the study shows, not every manufacturer uses Geofencing to protect drones from colliding with other objects. Stay on top of the latest news in the industry with Norfolk Aviation. We can help you with the search of your dream aircraft. Our sales experts will guide you through all the steps of process of buying or selling a plane. Call us today at 757-724-6047 to discuss what we can do for you!